The data are taken from climate model experiments of 12 (out of 24) different models that were conducted for the IPCC Assessment Report 4 using the SRES A1B greenhouse gas emission scenario. Plots on the right show changes in late summer and those on the left show changes in late winter. 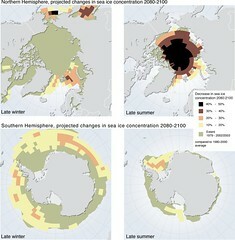 Notes: 1) sea ice extent is the area in which a defined minimum of sea ice can be found. sea ice concentration is the proportion of the ocean area actually covered by ice in the area of the total sea ice extent. 2) Small ocean inlets, such as those in the Canadian Archipelago, while not showing a decrease on these plots, are also expected to experience a decrease in sea ice concentration – this is an issue related to the resolution of the climate models.